I felt sure within the first month of practicing yoga that I’d teach this deeply intentional, contemplative practice. I understood that the benefits even at that point were vast, and that the benefits of me practicing rippled out beyond me into the world. Recently, I heard an interview with writer, podcast host, and theologian, Rob Bell, who said that, yes, we’ve sounded the alarm on healing the planet, but that it isn’t possible to truly heal our earth home until we heal our original home, our body. Hearing this, a light went on inside me. Yes, it is true–as long as we’re disconnected from this home we spend our life in, we can never connect to each other, to our country, to our planet at large. So, yes, I love to teach, but I also have come to believe it’s a necessity for me to teach, a necessity to show up to bear witness and hold space for people to come home to their body, fully exhale into their self, and begin to heal. Considering this, I believe yoga is an essential practice, something that can and should be a priority, for its benefits go beyond that which we can initially perceive. But it is also a great privilege–there are still vast peoples who are under-served and overlooked, not receiving the kind of care that would make healing in their life possible. And so, it is something I remind myself and others to be deeply grateful for. With this in mind, I invite you to join me in this upcoming 2019 Yoga Training. 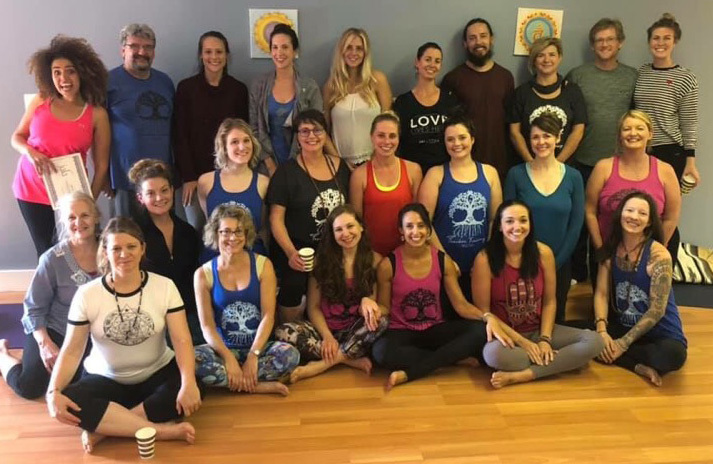 We are a school dedicated to creating a space for all to come home, to begin a disciplined practice that can help you to reconnect to yourself and to heal. The training is not just for teachers–it is for those who wish to investigate, dive deeper into yoga, understand the rich lineage of the practice, and to get to intimately know all of the work on, and off, the mat. It is for those who wish to be part of an uplifting and supportive community and for those who want to enrich their own life in a way that ripples outward to the community at large. It is also for those who, like me, very much want to reach outward through teaching this practice. In gratitude for this practice, we are offering multiple scholarship opportunities to make this training more accessible to all. We are grateful for the opportunity to teach and want the benefits of our teaching to extend in ripples near and far. Please contact Christa at 401-440-0279 or jalayoga.christa@gmail.com to talk about these scholarships and to sign up for our March 2019 training. This spring is a wonderful time to commit to a practice that will enrich your life, and the lives of so many around you. It is with this divine love that I understand my role as a teacher–to partake in, distribute, and share in an abundant spirit of love that exists always and everywhere. As I give, so too I receive. The power of service, then, means there is no helping. There is only unified participation in an endless flow of love and connection, available if only we pause to be in connection with all the layers of humanity before us, trusting that our open-eyed, open-hearted, willing presence will be enough. "Your ultimate goal is to be happy. Where is that happiness? Within you. If you want to have permanent happiness, it will never come from outside. If somebody makes you happy today, the same person will make you unhappy tomorrow. You are happiness and peace personified. Find that happiness and peace within you."